Provide comfort for the family of June DeKing with a meaningful gesture of sympathy. WATERVILLE: June A. DeKing, 71, formerly of Oriskany Falls, passed away Saturday, December 8, 2018 at the Waterville Residential Care Center. She was born February 15, 1947 in Cobleskill, NY, a daughter of William and Marion Haverly Roney and was a graduate of Cobleskill High School. On June 4, 1966, June married Willis DeKing, Sr. at the Oriskany Falls United Methodist Church. He predeceased her on January 26, 1996. June was a nurse’s aide who did private home health care and had worked in several area nursing homes. She had also worked at the Red Apple convenience store in Sherrill. She enjoyed playing games on her computer, keeping in touch with family and friends on Facebook, and was an avid reader. Her favorite times were those spent with her grandchildren and great-grandchildren. Surviving are her daughter and son-in-law, Melissa and Gordy Mohrbacher of Bridgewater; her beloved grandchildren, Haylee, William and Richard (Heather) Mohrbacher, and Willis DeKing, III, all of Bridgewater; cherished great-grandsons, Christopher, Colby and Memphis; sister, Barbara Gates of Richmondville, NY; two brothers and a sister-in-law, John and Deedee Roney of Warnersville, NY; and Joseph Roney of Kyle, TX; many nieces, nephews and cousins. She was predeceased by a son, Willis DeKing, Jr., and a sister-in-law, Kalina Roney. Funeral services will be held at 1pm Thursday, December 13, 2018 at the Burgess & Tedesco Funeral Home, Kloster & Northrop Memorial Chapel, 210 E. Main St., Waterville, followed by interment in the Hillside Cemetery, Oriskany Falls. Contributions in her memory may be made to American Cancer Society. 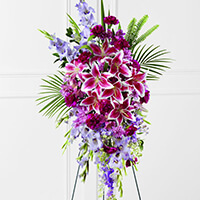 To send flowers in memory of June A. DeKing (Roney), please visit our Heartfelt Sympathies Store. Joe, Rachael and Chris sent flowers to the family of June A. DeKing (Roney). Joe, Rachael and Chris purchased the The FTD Tender Touch Standing Spray for the family of June DeKing. Those we love remain with us, for love itself lives on. And Cherished memories never fade because a Loved One is Gone... Those we love can never be more than a thought apart...For as long as there is a memory, They'll live forever in your heart.